Japanese Knotweed, is a strong growing, hardy, clump-forming herbaceous perennial native to the volcanic landscape of Japan. It has stout, deeply-penetrating rhizomes and considered notorious due to its rapid, suppressive growth, and being extremely difficult to eradicate. The invasive root system grows so aggressively that it can damage concrete foundations, buildings, flood defences, roads, paving, retaining walls and architectural sites. It can even turn up in your home by growing through the floor! Once established, and depending upon conditions, Japanese Knotweed can grow to a height of between 2-4 metres. The purple-speckled, green hollow stems are reminiscent of bamboo even down to the distinctive raised nodes. The lush, green leaves significantly differ by being broadly heart-shaped with a flattened base. Small white or cream-colored blooms appear in late summer and early autumn. produced in erect racemes. It is one of many pioneer plant species found across the globe which are the first species to colonize previously disrupted or damaged ecosystems. As they establish, this enables a chain of ecological succession to occur which ultimately leads to a more biodiverse and stable environment. 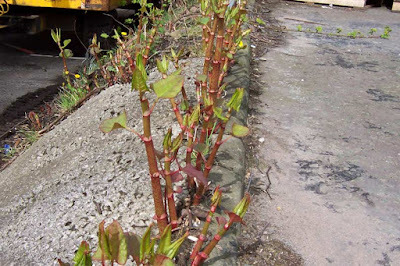 While Japanese Knotweed is listed by the World Conservation Union as one of the world's worst invasive species, it is not a problem in Japan as it is naturally kept in check the climate, natural pests and regular deposits of ash which keep the knotweed plants small. However they still survive this onslaught due to energy stores in its deep root system. They are particularly affected by the Mycosphaerella leaf spot fungus which can devastates knotweed stands and the Japanese psyllid insect, Aphalara itadori. 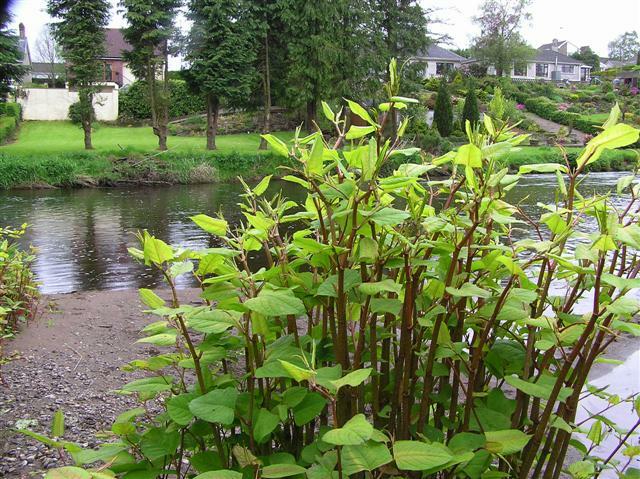 In the United Kingdom, such is the concern of finding Japanese Knotweed in your garden, that banks and other mortgage companies will apply very restrictive lending policies should it occur. In fact there are reports that several lenders have not only refused mortgage applications on the basis of the plant being discovered in the garden but even the neighbours garden! If you think that is bad then in Australia, it is illegal to have this species growing on one's property. Food for thought, which surprisingly Japanese Knotweed is a it is foraged as a wild edible vegetable in its native homeland.